Troubles and tribulations. Death and destruction. And that’s only the content of the story! But first, a commercial message. Feel free to hit the “Skip ahead 30 seconds” button on your remote. Hard as it may be to believe, this blog isn’t here just for your entertainment. It’s also here to sell books. Which is, admittedly, also for your entertainment, but at one remove. 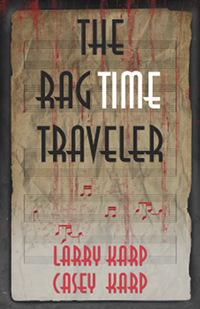 Anyway, consider this your occasional reminder that The RagTime Traveler is still for sale at all the usual venues. It still makes a great Christmas present. And on a related note, I’m planning to be at the West Coast Ragtime Festival on November 16 and 17. I’m not doing a formal signing, but there will be copies of TRTT for sale, and I’ll be happy to sign them if you catch me in the halls. Perhaps you’re familiar with the movie The Thing. I won’t go into detail; there’s a more than adequate write-up on Wikipedia. The key facts are that the movie was based on a 1938 novella by John W. Campbell, Jr., the novella is considered a classic piece of science fiction, and the author is better known as the editor of Astounding Science Fiction (later renamed Analog Science Fiction and Fact) from 1937 to 1971. Speaking as a science fiction fan, this is extremely cool news. Wildside Press is currently raising funds via Kickstarter to publish Frozen Hell in ebook, paperback, and hardback formats. This is, IMNSHO, a bad idea. Not that there’s anything illegal or immoral about the plan. Wildside is a legitimate small press, and the publication is being done with the full permission of Campbell’s heirs. My objection is authorly. Frozen Hell is not the version of the story that Campbell wanted the world to see. Nor is there any evidence Campbell tried to publish the longer version as a standalone novel at any point over the next thirty-some years, even though that was the time when science fiction novels became popular. In short, Campbell made the editorial decision that the novella was a better story. The novel should be considered a rejected draft. Would Mr. Nevala-Lee want someone to publish a draft of his latest book–perhaps a draft that doesn’t even mention the discovery of Frozen Hell? I doubt it. Shouldn’t Campbell’s wishes receive the same consideration?